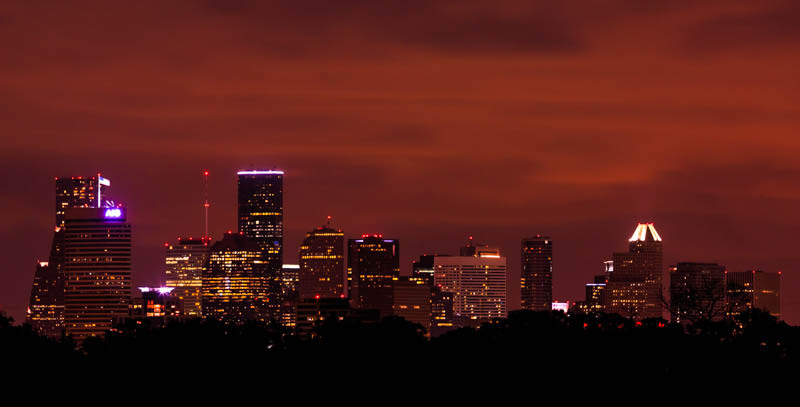 Back from Houston, Texas, USA. 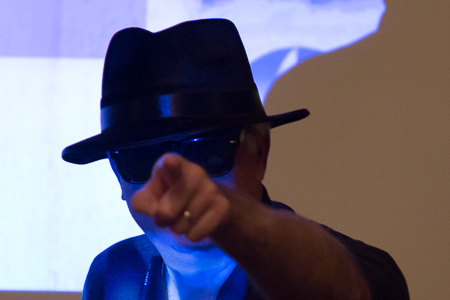 What a week in Houston, Texas, USA last week at the Revelation Software Users Conference. Everyone had a great time, the weather was great and there were some great photographic opportunities for me. I was considering limiting the kit that I took but I decided to err on the side of caution and took just about everything. Was anything not used, no, I think that every bit of camera kit was used during the week – a lesson learned I think. One of the highlights for me on the photographic side, was trying to put a slide show together that told the whole story of the conference. I ‘think’ and ‘hope’ that I nailed it and I certainly received some great comments from some of the delegates following it’s viewing during the closing remarks. Most of the captions will not make much sense unless you were there, but the video can be seen on the M4Photo website here. I hope that you enjoy this example of my work and I’d like to thank Mike for allowing me to take this opportunity to photograph the company’s conference. Down Town Houston from rather a long way away. 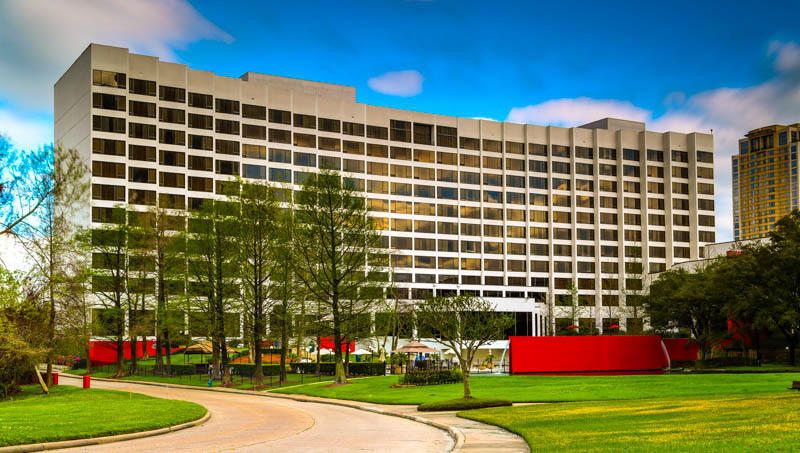 The Omni Hotel where I am staying is about 7 miles from down town Houston but the high-rise part of the city can be seen above the tree line from my hotel window. It therefore threw down a challenge to see what I could get. This image is no where near Paul’s work but I won’t apologise for the quality of the shot. I was unable to get onto the hotel roof and the top floor of the hotel’s car park is too low and most of the skyline is then obscured behind the Houston Memorial Park three line. This image is therefore taken on my extended 70-200 mm lens through a rather dirty window nine floors up. This shot was taken at night and with just a small amount of late twilight picking out some of the late evening clouds in the sky. First outing with my new filters. As it is Sunday and because I had a few hours to kill, I thought that I would get out and try my new Lee Filters today. It was pretty bright here in Houston for a while and a good opportunity to try both the Lee Big Stopper, to try to introduce some cloud movement into the images, and also an ND grad to reduce the glare of the very bright and cloudy sky. So armed with the 5D and the kit lens, filter set and my BeFree tripod, I headed downstairs and out into the hotel grounds. I began with a shot of the approach to the hotel (the image below). I preferred the composition of an earlier shot where I was not using the filter set and the clouds are frozen, but I wanted an image with the clouds moving and I am quite pleased with the image below for a first time effort. 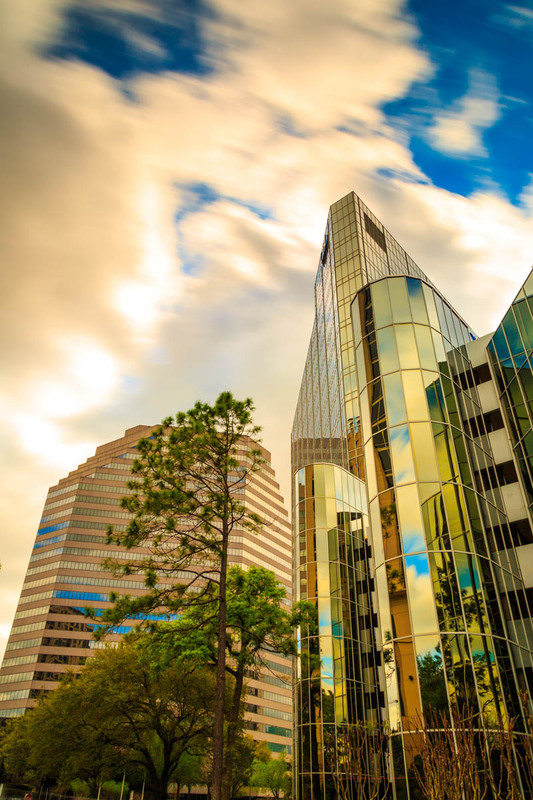 Moving further into the business area around the hotel, I found an amazing building with a reflective glass frontage which was curved and behind that a similar office block that is shrouded in highly reflective glass panels. Composing the shot with one over the other produced an interesting image of reflections from the surrounding buildings. Unfortunately, the breeze dropped considerably when I was capturing the hotel image and even with a long exposure the clouds did not move very much but the Big Stopper did manage to soften them a little. Admittedly, these two images have had some manipulation in Lightroom, but I was impressed with the portability and sturdiness of the Manfrotto Befree tripod and the Lee filter set is a joy to work with. Now to learn how to use them properly and to take some of the guess work out of the process. When I took out my M4Photo’s insurance I covered myself for Europe but I did not imagine I’d be heading further afield. However, this week has seen me extending that insurance to include Worldwide. Well, with my bags almost packed and a few last minute chores to get out of the way, I’ll be heading off to Heathrow overnight for a flight across to Houston for the next Revelation Software Users Conference. The camera will be in tow and I hope to get some good shots from the venue, the technical sessions and from the various activities that will have the delegates schedule full and entertaining for the duration of the conference. So long as the week is successful and i get some good shots, I guess that I’ll be able to consider M4Photo as an International organisation – not bad for the first year of operation. Well I guess that it had to be done. I’m short on time today and I thought that I would not get the chance to grab my camera and get outside. However, between a couple of phones calls I grabbed my old 20D and my big stopper filter and headed outside for five minutes. These images are really very poor for a number of reasons. Firstly, there was zero planning and preparation owing to an extremely busy week, I did not want to risk my new 5D, so this was taken on my old 20D and it was shot handheld (the tripod is packed away for a trip that i am making tomorrow morning. 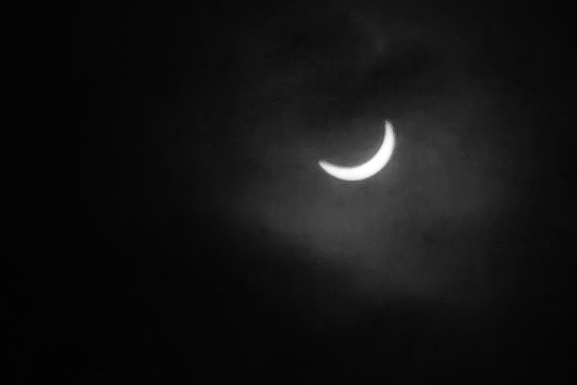 I also did not have the necessary eclipse glasses, so the camera setting and focus was all guess work. Finally, like most of the UK, the sky was covered in a thick white cloud. 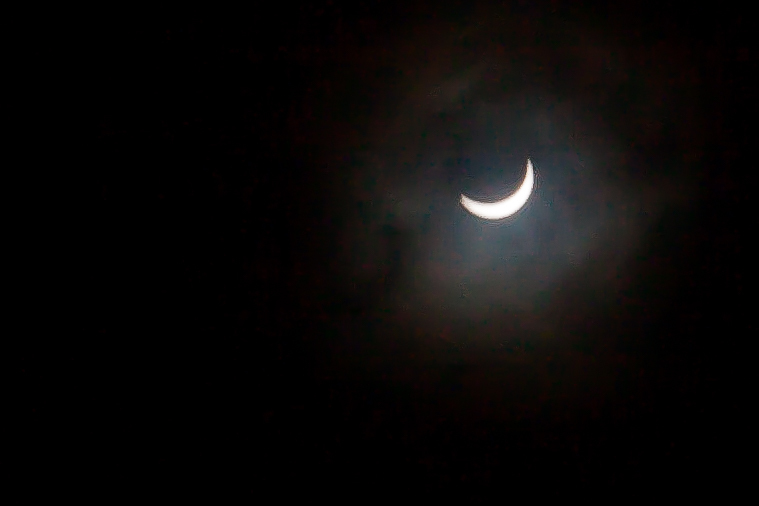 It did clear a little at one point and although the sun was still obscured by cloud i grabbed these two shots. Anyway, at least I got something for prosperity and something is better than nothing.